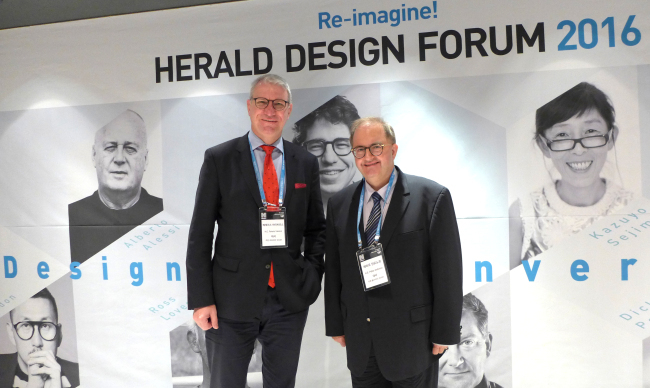 Herald Design Forum -- Asia’s largest conference exploring influential design ideas -- gathered over 800 participants Tuesday, many coming from disparate fields, for a day of unparalleled inspiration. At the Grand Hyatt Seoul, design specialists, scholars, students, bureaucrats and diplomats listened to the near-revolutionary ideas of industry gurus. 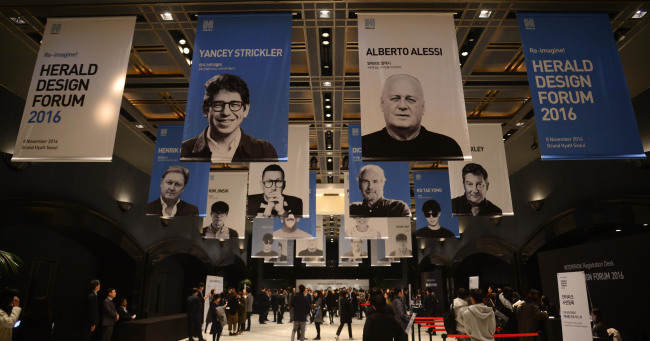 Under the banner “Design for convergence,” the forum delved into ingenious ways design, technology and business are coalescing thinking, connecting and producing. “The event is pure inspiration with excellent speakers every year,” said Edmund Schaffer, managing partner at German advertising firm Serviceplan, in an interview with The Korea Herald. Mentioning he has come to the forum the past four years, the German said his company’s former chief creative officer Alex Schill participated in the 2014 conference as a speaker. His firm -- the largest independent European company in the field with over 3,000 employees worldwide -- combines classical and digital advertising through integrative communications. Highlighting that Germany is well known for its pragmatic and efficient industrial design, he said, “Asia is influencing Europe a lot these days,” and noted that Korea has caught up quickly with its Western counterparts in the field. Sean Kim, who is in charge of product design of ovens and cooktops at LG Electronics’ design center, said the forum has “really opened” his mind with refreshing ideas and philosophies. “If you work in the same field, you develop a specialized and narrow view. Coming here has breathed new insights into my mind in terms of work methodology and design perspective,” Kim said. Latvian Ambassador to Korea Peteris Vaivars told The Korea Herald that for a small country such as Latvia, creative industries are significant. Latvia has a strong tradition of fashion design, furniture design and home design like glassware and candles, according to the envoy. Many wood and timber products sold at IKEA are designed and produced in Latvia, the diplomat pointed out. Bulgarian Ambassador Petar Andonov said he attended the conference to get a glimpse of the latest design trends. “Design is the driving force behind creativity and innovation that Korea has striven to push forward,” Andonov said. Bulgaria was on the ancient Silk Road corridor to Europe, so it has had a lot of cross-civilizational influence, and its culture today still bears similarities with those of Asian countries, according to the ambassador. “This is evident throughout our architecture, fashion and customs,” he said, adding that in recent years, the country has produced a large pool of talents in information and communication technology. “Bulgaria has many computer software engineers, web designers and programmers, and this is an area of major cooperation between Bulgaria and Korea,” Andonov said.